The Commission is carrying out an electoral review of Hartlepool Borough Council. To achieve these aims, we need to re-draw ward boundaries across Hartlepool. You can find out more about the review below. On 5 February 2019, we published final recommendations for future electoral arrangements in Hartlepool. We have now completed our electoral review of Hartlepool Borough Council. Final recommendations report for Hartlepool Borough Council. Final recommendations map for Hartlepool Borough Council - please note: this map is very large and may take some time to download. To view an interactive map of the final recommendations, visit our consultation area. You can view both the existing and proposed boundaries, and search by area or postcode. A draft Order - the legal document which brings into force our recommendations - will now be laid before Parliament. The draft Order will provide for the new electoral arrangements for Hartlepool Borough Council to come into effect at the local elections in 2020. We would be grateful if you could please spare some time to participate in our online survey. The survey seeks feedback on the review processes and procedures, to identify improvements that can be made. The consultation on the Commission’s draft recommendations for Hartlepool Borough Council closed on 10 December 2018. On 2 October 2018, we published our draft recommendations for the electoral review of Hartlepool Borough Council. From 2 October 2018 to 10 December 2018 we are accepting opinions and comments (submissions) from the public on these recommendations for Hartlepool Borough Council. Draft recommendations map for Hartlepool Borough Council - please note: this map is very large and may take some time to download. To view an interactive map of the draft recommendations, visit our consultation area. You can view both the existing and proposed boundaries, search by area or postcode, and have your say. A non-interactive image of the proposed ward boundaries is also available. The consultation on the warding arrangements for Hartlepool Borough Council closed on 12 August 2018. The consultation on warding arrangements for Hartlepool Borough Council has now closed. From 29 May 2018 to 12 August 2018, we accepted opinions and comments (submissions) from the public on where you believed ward boundaries should be in Hartlepool Borough Council. The Commission is minded to recommend that Hartlepool Borough Council should have 36 councillors in the future. This is 3 more than the current number of councillors. To view an interactive map of the existing warding boundaries, visit our consultation area. You can search by area or postcode. 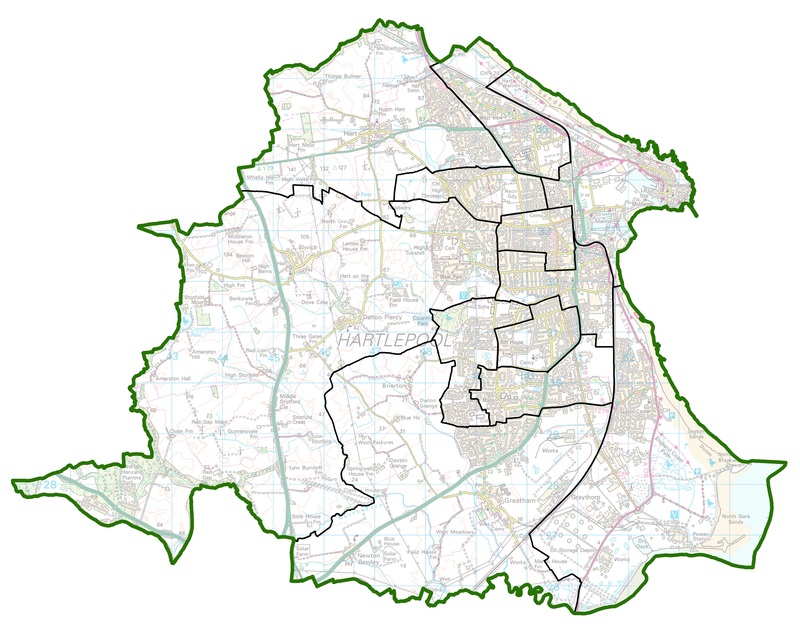 A non-interactive image of the current ward boundaries is also available. As part of the initial stages of the review, we consulted with Hartlepool Borough Council on the most appropriate number of councillors to be elected to the council in future. The Commission is minded to recommend that 36 councillors should serve Hartlepool Borough Council in the future. This is 3 more than the current number of councillors. This review was started by the Local Government Commission for England (LGCE) on 16 October 2001 but, following the transfer of the LGCE's functions to The Electoral Commission, the review was completed by The Boundary Committee for England (BCFE). The Order implementing The Electoral Commission's decision on the review can be viewed on Her Majesty's Stationery Office's website. 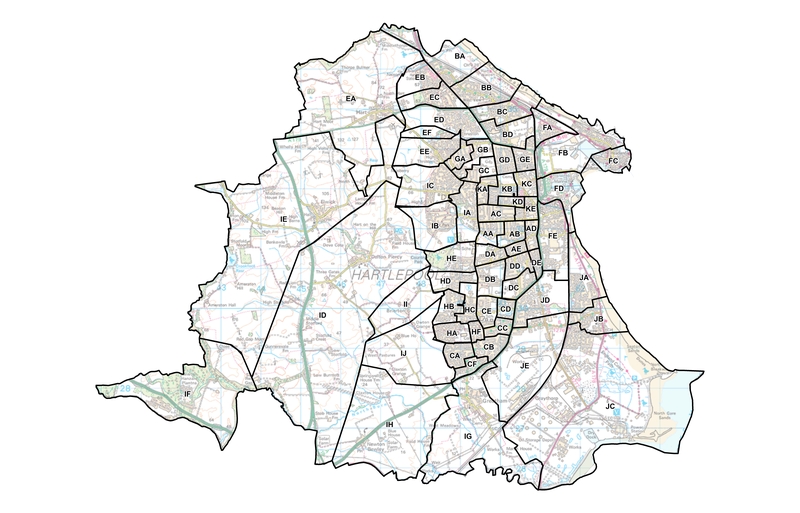 The current boundaries of the electoral wards and divisions can be viewed on Ordnance Survey's election maps website. Parish warding is not shown on the election maps website. It can be seen on the mapping from the Committee's final recommendations below; any modifications are listed in the Explanatory Note at the back of the Order. Final report, published on 21 January 2003. 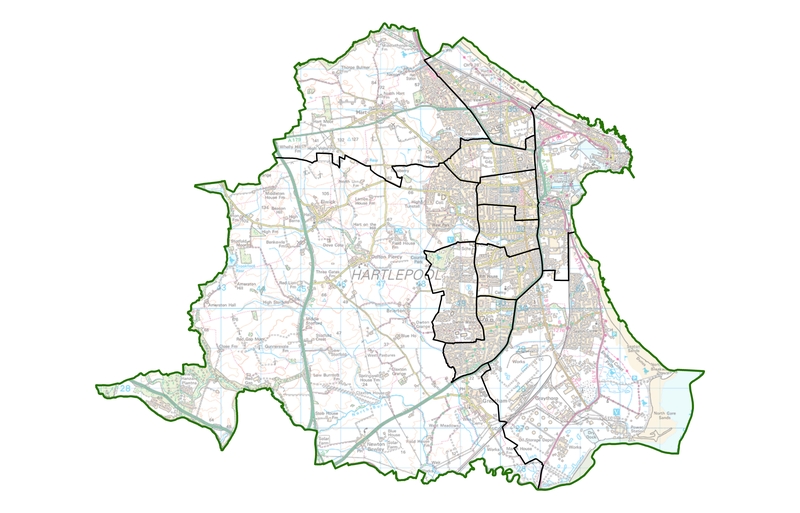 Large map, illustrates the proposed ward boundaries. Draft report, published on 14 May 2002.